Are you tired of the default New Tab Page in Google Chrome and want something more useful and artistic? Then join us as we look at the Incredible StartPage extension. Here is the default “New Tab Page” in our Chrome Browser…it looks rather plain and boring. How about something better? 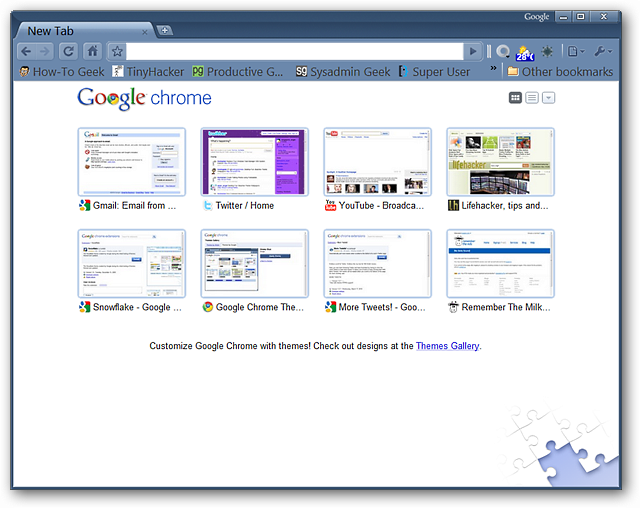 This is what our “New Tab Page” looked like after installing the extension. 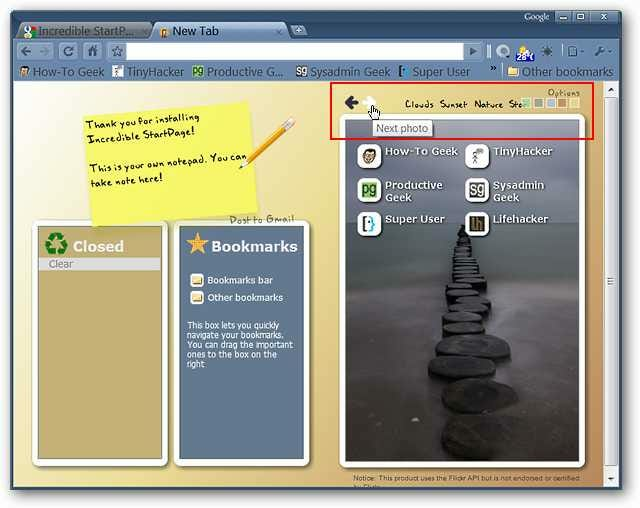 As you can see there is a “Note Section”, “Closed Tabs Section”, “All Bookmarks Section”, and a “Bookmarks Toolbar (links only) Section”. Note: Clicking on links in Incredible StartPage will open them in the current tab. If you want you can easily modify how Incredible StartPage looks using the “Options” in the upper right corner. After only a couple of minutes our “New Tab Page” was looking nice…new background color, image, and altered note. A very useful feature of the “Note Section” is that you can add your notes to an e-mail by clicking on the “Post to Gmail Link” just below the note. Note: Special “Chrome Pages” (i.e. 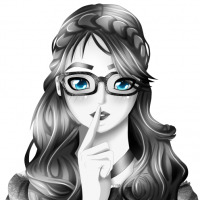 Extensions) will not open from the “Closed Tabs Section”. 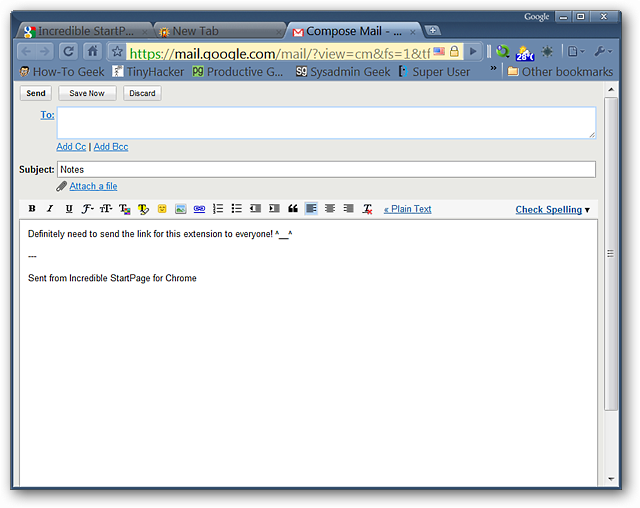 When you click on “Post to Gmail” a new tab will be opened with your notes pre-pasted into the main letter body. All that is left for you to do is select the appropriate e-mail address(es) and to make any desired modifications to the “Subject & Letter”. 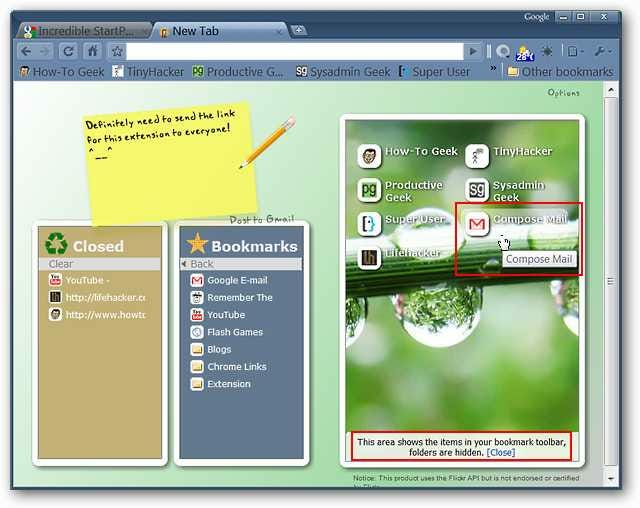 Going back to the “New Tab Page” you can trade bookmarks back and forth between the “All Bookmarks Section” and the “Bookmarks Toolbar Section”. 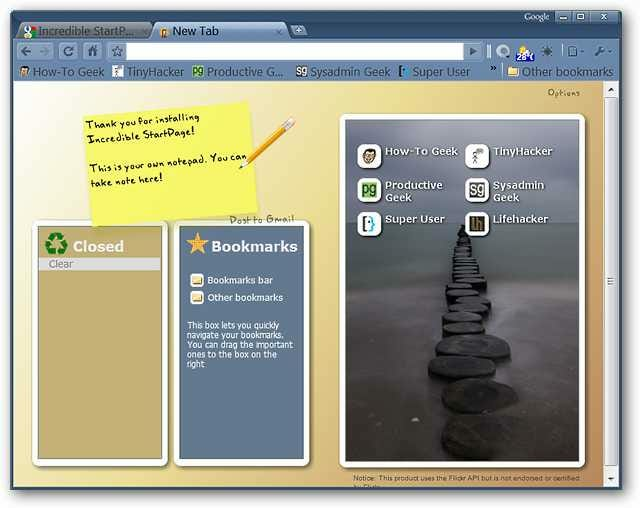 Simply drag-and-drop as desired…but keep in mind that any changes made here will also be reflected in your “Bookmarks Toolbar & Other Bookmarks”. 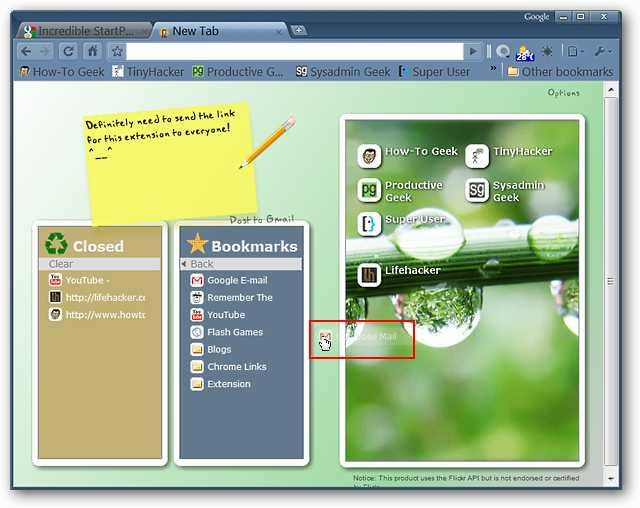 There is our bookmark freshly traded over to the “Bookmarks Toolbar Section”…looking very nice. If you are tired of the default “New Tab Page” in Google Chrome then the Incredible StartPage extension will make for a refreshing change.